Minuteman is an Illinois-based microbrand with a decidedly patriotic philosophy. Their watches are assembled in the USA, the packaging is American made, and they donate 25 percent of their annual profits to veterans' charities. The brand has long been on my radar, but I have not had the opportunity to try one in person until now. For this review, they let me borrow a Darby, an automatic field watch rated for 200m water resistance. The watch arrives in a zippered, padded pouch, embroidered with the Minuteman name and logo. I am not a fan of bulky watch boxes so I appreciate it when a company can pack their watch is something useful instead. The brushed stainless steel Darby (and its DLC black stablemate) is 42mm wide excluding the crown guards, 47mm long, and 12.5mm thick from the case back to the top of its double-domed, AR coated sapphire crystal. These reasonable proportions will put the Darby right in the sweet spot for most wrists. It exhibits sufficient presence while maintaining a modest profile that will slide under most shirt cuffs. Polished finishes on the fixed bezel and screw-down crown add just a touch of flash for a look that is slightly dressier than the usual tool watch. Minuteman takes its name from the citizen militias who fought for the rebellious American colonies in the Revolutionary War. One of these fellows graces the case back and crown. Personally, I could live without the somewhat cartoonish charging figure on the case back, but the bigger issue for me is the man's face on the crown. The downsized image loses all definition, so what remains is blobby and distorted. It's hardly a deal breaker, but it is a missed opportunity. Inside the case beats a Miyota 9015, the same 24 jewel automatic found in many a microbrand. It hacks, hand winds, sweeps at a smooth 28.8k bph, and has a power reserve of over 40 hours. The tan-on-black dial is an appealing pastiche of field watch and diving watch. The four lumed darts containing the primary hours remind me of some 1960's divers such as the Eterna KonTiki, but I don't recall any that featured a broad minute track like the Darby. Smaller numbers towards the inner part of the dial mark 24-hour time. This is a common feature on many field watches, but the Darby's radial layout is not. The hands appear to have squared ends at first glance, but close inspection reveals that they are polished and faceted with short, pointed tips. They are just long enough to meet their markers (the 24-hour markers in the case of the hour hand), and I liked the way the stem of the second hand almost disappears against the dial while its red-tipped arrowhead travels neatly through the hours index and extends into the minutes track. 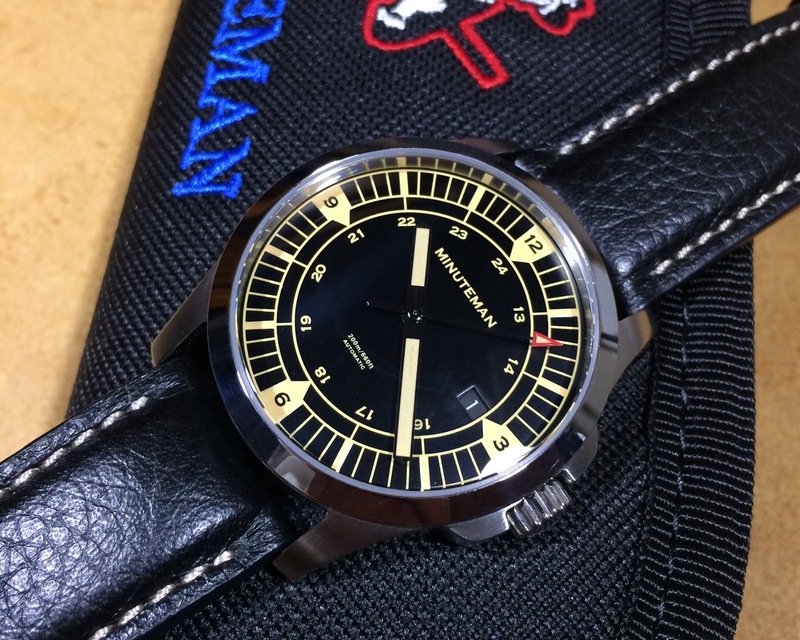 There is no logo on the dial, only the Minuteman name in a clean, modern typeface. Water resistance and "Automatic" are so small as to be almost unnoticeable. The Darby presents an attractive face, and the more I examined it, the more I liked it. In keeping with Minuteman's home-grown ethos, the Darby's leather strap is made in America. It is 22mm wide, lightly padded, and exceptionally soft. The black leather and beige stitching complement the similar colors on the dial. I enjoyed my time with the Darby. It is a sharp looking and nicely finished watch. The brushed and polished case I sampled could easily serve for both weekend and work week duties, while the DLC black would be a great choice for those who want a more tactical look. Full retail is $600 and it is currently on sale for $499, which is even better when you know that part of the money will be going to a worthy cause. If the black and tan look is not for you, then you might consider the RWB, which offers the same package as the Darby but with a white-on-blue sunray dial for about $30 more.